For Advanced Surface Design, I proposed my next project after the reliquary to be creating a rock garden using stitch resist and Indigo dye. I planned to cut a piece of fabric into three pieces, stitch resist them separately, dye them, and then sew them back together again. The stitch resist took about 5 hours alone. I stayed up till 3:30am for the first one. 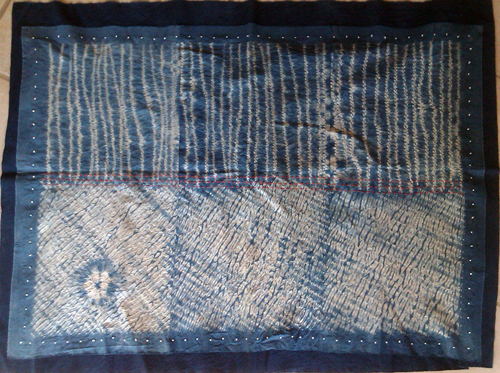 After all three had been stitched and the stitches were pulled tight, I put them in the indigo dye. The most rewarding part of this project had to be when I was taking all of the stitching out after dying each piece and seeing the resist lines on the fabric. It was also fun to watch my hands turn blue. 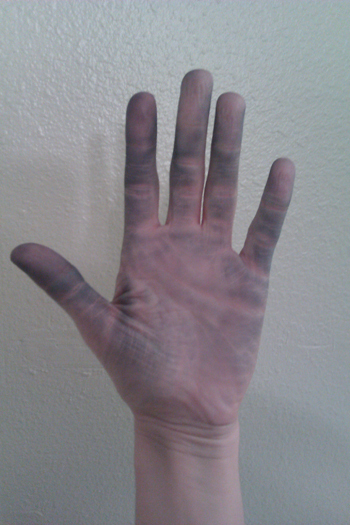 There's something so rewarding to me about getting my hands dirty in the creative process. I had made a plan of how I was going to get the entire project done before the critique. However, the critique was changed to an in progress critique and so we did not have to have our projects completely finished by March 26th. On that day, I simply had a piece of blue fabric that had been stitched back together with some shibori on it. Clearly, it needed something else. So I decided to start making french knots all the way around to make a simple border. After that, it still needed something. I consulted with my professor and we decided it needed something to break up the middle ground: red stitches. And then after I was finished with that, it still needed something, didn't it? Another simple border. I dyed a piece of cotton navy blue, but it wasn't dark enough for my liking, so I put it in the indigo dye a few times to get it an even deeper blue. And then, it was done.